All of us have caught the home improvement bug at some point. Maybe you’re someone who enjoys having people over for dinner and charades, maybe you use your house for business meetings or perhaps you simply enjoy showing off your home. Whatever the reason, we want our properties to look good and be memorable to our guests for all the right reasons. That’s when home improvement becomes important. There are a number of different ways you can go about capturing your friend’s attention, but before you pick up a hammer and attempt to DIY build a tree house in your garden, have a read of some tried and tested ideas for impressing your guests that won’t end in disaster. Basement conversions always look amazing. So many home owners throw away a ton of potential by just using their cellar as extra storage space. You have space at your disposable that you can turn into pretty much anything, so use it. You could create a man cave, a children’s play den or even a cinema. The options are limitless. Sounds expensive though, right? It doesn’t matter. We Buy Any Home recently released new figures that show how you can be adding value to your home and revealed that a basement conversion can increase the value of your home by 30%. In fact, it’s the best investment you can make, better even than converting your loft, garage or kitchen. Taking your guests into a secret gym or guitar collection you have underneath your house will never fail to impress. You’ll go from Joe the lawyer to Batman in an instant. Yes, that’s right, doors. Doors are cool, or at least they can be. Do some research into what makes an enticing door entrance and the different ways you can use them to your advantage. While you’ll probably want something solid and reassuring on any external doors you might have, once inside you can let your imagination run away. Hidden doorways and secret passages are a lot more feasible than many people realise. Sliding book cases, fireplaces that fold inwards and wardrobes with false backs can all be purchased for less than £450. It’s even cheaper if you buy a kit online and do it yourself. It’s not hard to wow your guests if you have a wine collection hidden behind a wall panel. Even if you think that the idea of a secret door is childish or too much hassle a simple change in your door styles can still go a long way. Just make sure they maintain a nice consistency throughout your house. Perhaps even consider installing an interior barn door? That would certainly capture your guest’s attention. It’s an item of power that certainly takes some balls to try but is well worth it if you do it properly. The first impression people get of your house will typically be in the hallway or entrance area. You want to make sure that it is clutter free and feels as roomy as possible. Ditch the grubby welcome mat and consider maybe laying some wood flooring. 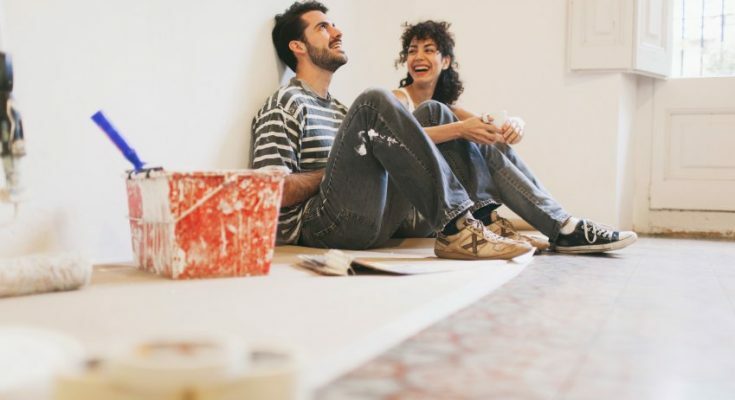 Flooring is easier to keep clean than carpet, which is essential when it’s the area of the house where people are going to be entering with muddy shoes. These areas are often dark, see what you can do to add some extra light and character to it. Candle fittings are a nice touch, as are paintings and mirrors. Get creative, if you’ve got a path leading up to your house make it more appealing. Some simple additions such as small lights and putting down some stepping stones can make a huge difference. Add some flowers, a bird box, and a water feature/rock garden to make the journey to your home that bit more exciting and impressive. Having fake grass is another idea to improve appearances. Putting it in your front or back garden is a trend that is starting to take off due to the installation service becoming more affordable. Fake grass looks good all year round without being impacted by the weather. It’s been raining for the past two weeks straight so you haven’t had a chance to get out there and give the lawn a fresh trim? No problem. Have the kids suddenly discovered a previously hidden passion for football? No problem. Eco-friendly and leaving you more time to focus on the other areas in your garden, it’s no wonder fake grass is making people green with envy. Don’t be scared to try things out, there are so many other things you can put in your back garden to make it more interesting, you could build a Moon Gate or maybe even consider turning your run-down shed into something slightly more spectacular. If you have a little bit of extra cash to splash, a large summer house rarely fails to impress can provide a lovely place to have a spot of lunch with guests when the weather is good. There are always small, quirky extras you can add to your home to make it more impressive. You could get an outdoor swing set, an automatic bin, a chandelier that turns your room into a forest or hidden power outlets. The options are limitless. Have a look around, do some shopping. Keep it easy, sometimes the genius is in the simplicity. One of the best ideas I saw was a rotating dinner table, perfect for families who enjoy putting all the food in the middle of the table and self-serving dinner.